I cheated on this one and used reflector. This was an excuse for me to try reflector out… so I started with that in mind. The Checking code ends up being in crackme->WindowsFormsApplication4->Form1. You can deduce what most the buttons do. The relevant one turns out to be in asd. The keygen is basically straight from the verifying function found there, written in C#. Overgeneralization, but may be helpful. cdecl: parameters right to left on the stack, caller places parameters and removes parameters. gcc uses this. 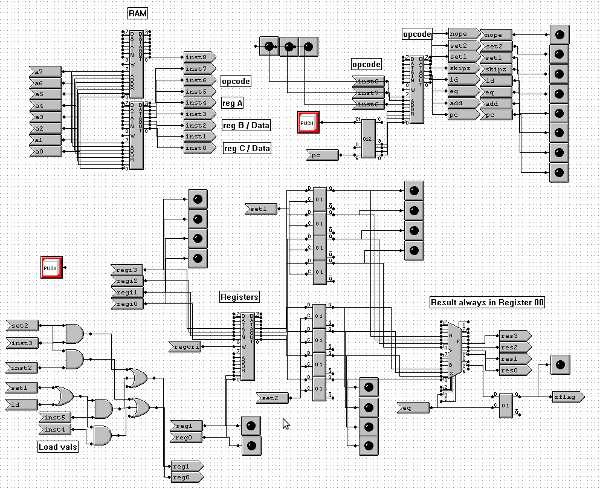 This is an RTOS developed by myself, with some code taken from FreeRTOS. This is some of the most difficult code I have ever written, although it really doesn’t do anything useful. Man, context switching in C can be a bear! It’s like a programatic buffer overflow! (seriously, you do a function call and just pop off enough stuff to overwrite the instruction pointer). The purpose of this assignment is to begin implementing our RTOS. You are to implement the first several functions and data items listed in the UIKAPI documentation: UIKInitialize, UIKAddTask, UIKRun, UIKDelay, and the internals UIKDispatcher, UIKIdle, UIKTickHandler, UIKTicknum, UIKTickLen, and UIKIntDepth. This will also involve the implementation of the context-switching mechanism you will use inside the process of switching tasks. In order to demonstrate your scheduler and the use of the API, you can modify some of your earlier assignments to use the API, or write new tasks. You should be able to demonstrate the current execution of at least three tasks at once, all being scheduled by your system. The code will follow at the end, but first, a video demonstration. can be done in groups of up to two people. new semaphore, or a value of -1 if there was problem creating the semaphore. the result is negative, should block the requesting task. by changing its state to ready. + INT8 UIKSemValue(UIKSem* sem); – will return the current value of the semaphore. the proper operation of your semaphore functions. The critical sections are implemented by disabling interrupts. In this assignment, there is a task that delays in the middle of a semaphore lock to demonstrate the trace when two tasks are fighting for the same resource. the UIKAPI. This is the last piece of the UIK we will implement – yeah! wait until that flag is set. Once the flag is set, the task can become ready. purpose of this exercise, only one event flag will be defined: Bit 0 represents a timer event. timer by setting bit 0 in the event flags variable. the event. In other words, the task will not be scheduled when the event occurs. the proper operation of your event functions. Events are fairly straightforward. project6 adds a timer0 event. taskblinky3 (in tasks.h/tasks.c) is associated with a timer0 overflow via a call to UIKAssocEvent (which sets the task to a wait state and associates the function with the flag). It uses a global flag, EVENT, to keep track of when an interupt occurs. Then, during the tick, if this EVENT flag is set then the function associated with this event will be set to ready. I guess I’ll post most of it inline here too, because why not? * This is a simple demonstration of the uik api. asm volatile ( "push  r0               nt"
* the context save so we can write to the stack pointer. asm volatile (    "lds    r26, currTCB               nt"
* that this has a chance to complete. Due to the complex nature of this program, it was compiled with AVR Studio on Windows XP. Although I certainly miss my usual development tools on Linux, the AVR studio debugger was much better in my opinion. To compile, open project6.aps, select Build->Rebuild All. To copy to the Atmega16, click on the “AVR” sprite. Under Program ->Flash, click the “Program” button and select the homework4_*.hex file. Of course, everything should work under linux as well.